If you celebrate Christmas, it’s likely that your to-do list is long right now. Preparing to travel, to feed family, to celebrate, or to give presents. And if this is indeed a season of giving gifts, consider the type of gifts that are more experiential, than material. The type of gifts that create memories, support creative expression, enhance one’s health and wellbeing, or can be consumed. These type of gifts keep sparking joy or support for your loved ones, without the risk of material items cluttering up their homes. And if Yoga and Acupuncture are on the list, we have some specials for you (and your loved ones) just in time! $85 for 5 Acupuncture Treatments! Our season sale on Acu-punchcards is from December 17th-24th. These punchcards don’t expire, there’s no limit on how many you purchase, and they make great gifts! Purchase in person, by phone, or online. Purchase a 10 or 20 class pass and receive free Yoga you can gift to a friend! Receive 1 Free class when you purchase a 10 class pass! Receive 2 Free classes when you purchase a 20 class pass! 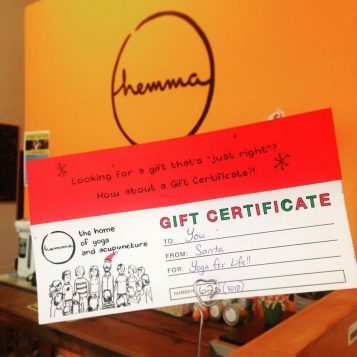 If you’re not sure what to get, you can purchase a gift certificate for any denomination which can be used towards Yoga, Acupuncture, or anything our store. Whatever you celebrate this time of year, we wish you all the best! We wish you joy, connection, good food, and rest!